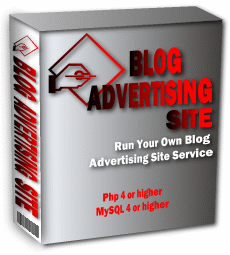 Manage and Host a Blog Advertising Site with Minimal Work Involved. Your Visitors Will Thank You For These Innovative Features! Easy Automatic Signup Process. Even people new to the Internet can sign up for their own blog in minutes with an easy to use sign up form. Easier To Manage Members. Owner can manage memberships via admin area to assist new members or to block anyone you need to for any reason. This keeps bad bloggers out of the system, letting the good bloggers do what they do best. Your Blog Advertising Site System Includes Money Making Programs! No technical knowledge is required! You don't need to be an expert in web design or PHP script writing to start your own blog website. With Blog Advertising Site, you can set up your system in a short amount of time with zero headaches. Just follow the simple step-by-step instructions and install. This PHP script has a retail value of $97.00 but our price is just $1.00!